Handeni Gold Inc. extends Target 5 gold anomaly to 1800 X 900 meters. Vancouver, British Columbia, July 30, 2012 — Handeni Gold Inc. (the “Company” or “Handeni Gold”) (OTCQB: HNDI) is pleased to provide an update on the exploration activities on its 800 km2 Handeni property in the United Republic of Tanzania. The Company’s focus is currently on upgrading its identified targets on the four prospecting licenses (each a “PL”) areas (Fig. 1) to drill target status. To this effect primary focus is currently on the 200km2 covered by PL6743 even though exploration is continuing on the Company’s other PLs. Fig. 1: Diagrammatic representation of the Handeni Gold PL areas with previously drilled targets Kwandege (purple) and Magambazi East (blue) outlined. The positions of Target 5 (red) and Target 6 (green) are also indicated, both located on PL6779. A total of 5050 soil samples (including blanks and standards) from targets in PL6743 are currently being analysed by XRF(hand-held X-Ray fluorescence) and prepared for submission to assay laboratories. In collaboration with the Tanzanian Geological Survey a soil sampling program is currently being undertaken on Target 6 (Green square Fig. 1). The results of the soil sampling program on Target 5 received to date are highly encouraging, with gold in soil values of up to 200 ppb encountered. Au (gold) assay results received for 2331 samples are plotted on Fig. 2. The geochemical target coincides with a magnetic and electro-magnetic geophysical anomaly on surface over an area of approximately 1.8 km (N-S) by 900 m (E-W). The anomalous gold zone apparently dips East to Southeast as part of a large fold structure. High Au values coincide with topographic highs. The evaluation of this target will be continued by pitting, trenching and ground IP (Induced Polarization). The evaluation of the “alluvial” gold potential is now progressing rapidly. The drilling of 3 successful RC (reverse Circulation) holes for water solved the constant water shortage problem and the wells are now providing the washing and separation operations with a sustainable 15 000l/h from two of the holes currently being utilized. This water also secured a water source for future drilling operations on our PLs. 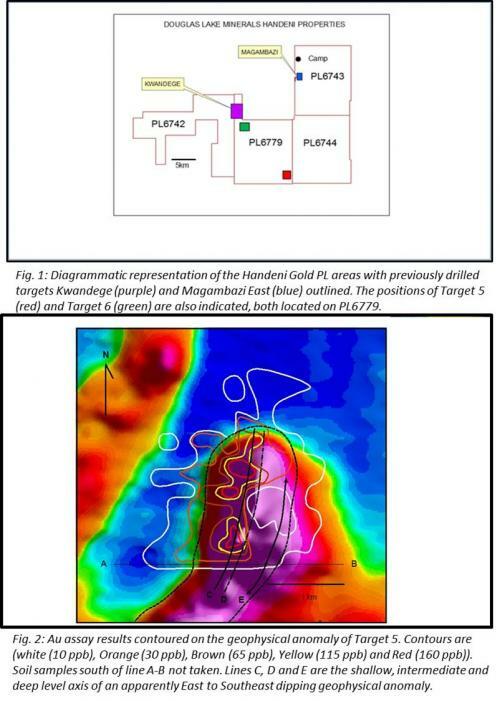 Approximately 32% of a pitting, trenching and separation exercise on the area targeted for the evaluation of a potential “alluvial” gold operation is currently completed. Fig. 2: Au assay results contoured on the geophysical anomaly of Target 5. Contours are (white (10 ppb), Orange (30 ppb), Brown (65 ppb), Yellow (115 ppb) and Red (160 ppb)). Soil samples south of line A-B not taken. Lines C, D and E are the shallow, intermediate and deep level axis of an apparently East to Southeast dipping geophysical anomaly. d) XRF (hand held) analyses of soil samples taken to produce an algorithm to relate Au anomalies to soil geochemistry. The aim is to reduce assay cost as well as to characterize the two main styles of mineralization identified on the HNDI properties. “Handeni Gold is currently doing what we believe an exploration company should be doing under the current market conditions: exploration.” said Dr. Reyno Scheepers : President and CEO of Handeni Gold. We are in the fortunate position that results from our exploration efforts are adding value to our projects as planned” he added. The Company is an emerging mineral exploration company focused on exploring and developing mining opportunities in Tanzania. For more information, go to www.handenigoldltd.com. Except for the statements of historical fact contained herein, the information presented in this news release constitutes “forward-looking statements” as such term is used in applicable United States and Canadian laws. These statements relate to analyses and other information that are based on forecasts of future results, estimates of amounts not yet determinable and assumptions of management. Any statements that express or involve discussions with respect to predictions, expectations, beliefs, plans, projections, objectives, assumptions or future events or performance (often, but not always, using words or phrases such as “expects” or “does not expect”, “is expected”, “anticipates” or “does not anticipate”, “plans, “estimates” or “intends”, or stating that certain actions, events or results “may”, “could”, “would”, “might” or “will” be taken, occur or be achieved) are not statements of historical fact and should be viewed as “forward-looking statements”. Such forward looking statements involve known and unknown risks, uncertainties and other factors which may cause the actual results, performance or achievements of the Company to be materially different from any future results, performance or achievements expressed or implied by such forward-looking statements. Such risks and other factors include, among others, the actual results of exploration activities, the availability of capital to fund programs and the resulting dilution caused by the raising of capital through the sale of shares, accidents, labour disputes and other risks of the mining industry including, without limitation, those associated with the environment, delays in obtaining governmental approvals, permits or financing or in the completion of development or construction activities, title disputes or claims limitations on insurance coverage. Although the Company has attempted to identify important factors that could cause actual actions, events or results to differ materially from those described in forward-looking statements, there may be other factors that cause actions, events or results not to be as anticipated, estimated or intended. Forward looking statements are made based on management’s beliefs, estimates and opinions on the date the statements are made and the Company undertakes no obligation to update forward-looking statements if these beliefs, estimates and opinions or other circumstances should change, except as required by applicable law. Such forward-looking statements reflect our current views with respect to future events and are subject to certain risks, uncertainties and assumptions, including, the risks and uncertainties outlined in our most recent financial statements and reports and registration statement filed with the United States Securities and Exchange Commission (the “SEC”) (available at www.sec.gov) and with Canadian securities administrators (available at www.sedar.com). Such risks and uncertainties may include, but are not limited to, the risks and uncertainties set forth in the Company’s filings with the SEC, such as the ability to obtain additional financing, the effect of economic and business conditions, the ability to attract and retain skilled personnel and factors outside the control of the Company. These forward-looking statements are made as of the date of this news release, and the Company assumes no obligation to update the forward-looking statements or to update the reasons why actual results could differ from those projected in the forward-looking statements, except as required by applicable law. Although the Company believes that the beliefs, plans, expectations and intentions contained in this news release are reasonable, there can be no assurance those beliefs, plans, expectations or intentions will prove to be accurate. Investors should consider all of the information set forth herein and should also refer to the risk factors disclosed in the Company’s periodic reports filed from time-to-time with the SEC. This news release shall not constitute an offer to sell or the solicitation of an offer to buy securities of the Company nor shall there be any sale of these securities in any jurisdiction in which such offer, solicitation or sale would be unlawful prior to registration or qualification under the securities laws of any such jurisdiction.